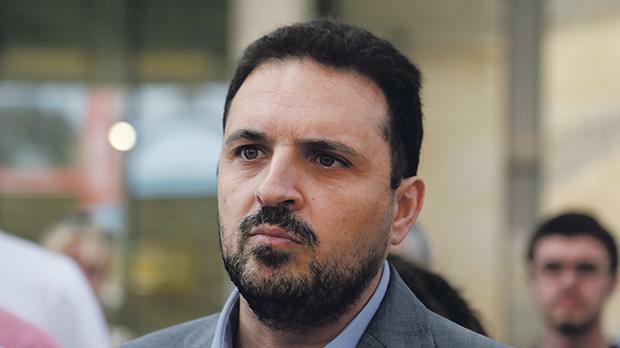 Nationalist MEP candidate Michael Briguglio has endorsed the call made by executive committee president Mark Anthony Sammut for the PN to tackle the serious allegations levelled against its leader Adrian Delia. However, in what can be interpreted as veiled criticism against the approach being taken by party officials close to Dr Delia, he warned that such debate should not take the form of a show of force in the leadership. “One cannot simply turn a blind eye to such allegations. What is going on? What is the way forward? These are the questions I am being asked right now during house visits,” Dr Briguglio told the Times of Malta. Apart from Mr Sammut, the MEP candidate is the only one within the party structures to have publicly called for action on the matter. For the last few weeks Dr Delia has been facing calls to resign in the wake of domestic violence allegations, issues related to his personal finances and money-laundering claims related to a Soho-based prostitution racket dating back to 2004. While denying any wrongdoing, the PN leader is insisting that such claims are being levelled by those who did not accept the democratic will of the party members that elected him in September 2017. Party sources who spoke to the Times of Malta on condition of anonymity on Thursday said that Dr Delia was expected to appear before the executive committee (the second-highest organ after the general council) and the administrative council which tackles issues of a disciplinary nature, early next week, possibly Monday. However, by the time of writing no date had been set yet. Dr Briguglio, a PN candidate for next May’s European Parliament election was asked for his reaction in the wake of an earlier tweet in which he had said that “politics close to the people was done through dialogue and not forcefully”. His appeal was made as sectional committees, general council members, and various branches are being pressured by officials close to the leadership to publicly declare their absolute loyalty in Dr Delia. This “mobilisation” was also felt in the manner in which an annual festive reception held yesterday evening at the Pietà headquarters was being billed as a show of force in the leadership. While not pronouncing himself when asked if he still had trust in the PN leader, Dr Briguglio on Thursday insisted that regardless of his position, the “very serious” allegations against Dr Delia had to be discussed. “Such issues are not resolved through a show of force or show of hands, but through a proper debate,” he remarked. The former Alternattiva Demokratika chairman noted that after the 2017 election he had joined the PN as he had felt that the party was open to debate, but at the same time noted that in the current situation certain questions needed to be addressed. “I am four-square behind Mr Sammut’s position on the matter. I cannot be a candidate and ignore what the people are saying. Such concerns are being aired across the board even from those who are staunch supporters of Dr Delia,” he said. Dr Briguglio added that a proper democratic process, warranted proper deliberation. Meanwhile, despite his weak support among the parliamentary group, PN sources said that Dr Delia could still manage to forge ahead, at least until May’s elections. “While there are at least 14 out of the 28 PN MPs who are ready to make a formal request in writing for the leader to reconsider his decision not to resign, the lack of a succession plan on who would step in to take over, is believed to be the reason behind their decision to stay on the fence,” they said. However, failure to make any inroads in next May’s elections, might be a bridge too far for Dr Delia, the sources added.